27 Feb 2019: Shocks are found everywhere in the universe, and is space around Earth we have unique possibilities to study them in detail using facilities such as our instruments on ESA's Cluster satellites. In the paper "Direct evidence of nonstationary collisionless shocks in space plasmas" today published by Science Advances, Andrew Dimmock and co-authors demonstrate the crucial role of small scale structures inside the gigantic shocks. It also shows that after almost 19 years in space, our instruments on Cluster are still capable of delivering data allowing great science. Read more in our and ESA's press releases. 1 Feb 2019: Today Andreas Johlander succesfully defended his PhD thesis Ion dynamics and structure of collisionless shocks in space. Faculty opponent was professor Robert Wimmer-Schweingruber, University of Kiel, Germany. 7 Jan 2019: ESA has selected our APEX cubesat consortium for the Hera mission proposed to explore the binary asteroid Didymos. Jan 2018: In a paper in Physical Review Letters, Lina Hadid and co-workers reveal the energy flow in the turbulence in the Earth's magnetosheath. Oct 2016: In a paper in Physical Review Letters, our PhD student Andreas Johlander have used the Magnetospheric Multiscale (MMS) satellites to find out the details of shock waves in space. See also our press release. Oct 2016: In a paper in Journal of Geophysical Research, our PhD student Elin Eriksson suggests new ways electrons can be accelerated in a shocked solar wind, based on the Magnetospheric Multiscale (MMS) satellite data. The paper was selected as Editor's Highlight. May 2014: The properties of asymmetric magnetic reconnection, important for storage and release of magnetic energy in a variety of cosmic contexts, could be explored in detail with our and other instruments on ESA's Cluster satellites. The results were published in Physical Review Letters. Jul 2013: Magnetic reconnection can be more efficient in accelerating electrons to high energy when variable rather than steady, we show in a paper in Nature Physics. Aug 2012: Exploring the properties of thin sheets in space, we have for the first time been able to verify the properties of so called lower hybrid drift waves in space around Earth, using our instruments on the multi-spacecraft Cluster mission. The results were published in Physical Review Letters: see also our press release. 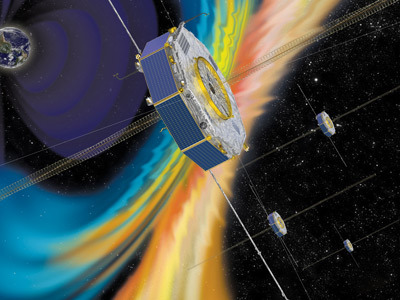 Jan 2012: Cold plasma previously hidden in the magnetosphere is revealed by our instruments on the Cluster satellites in a study we publish in Geophysical Research Letters, also featured in National Geographic Daily News and an AGU news release. Jan 2012: We show that dusty plasma around Enceladus affects Saturn's magnetosphere. See the NASA mission news feature or the editor's highlight in Journal of Geophysical Research. Jul 2011: Plasma jets are common in the universe, and now we know the details of what happens when they hit an obstacle, using our instruments on the Cluster satellites in the Earth's magnetic tail. ESA highlights the study, published in Physical Review Letters. Oct 2010: Small pulse-like waves known as electron holes dwell at the heart of a magnetically explosion in space, known as reconnection, we show from our Cluster data in study in Physical Review Letters. See also our press release. Oct 2010: We contribute to a study in Science showing th at pulsating aurora is caused by waves in space known as chorus emissions. See also the National Geographic news feature. March 2010: Pressure fronts in the solar wind help erode the atmosphere of Mars, we show in Geophysical Research Letters. See also our press release. July 2009: How is the solar wind heated? Part of the answer is turbulence, as shown in a study in Physical Review Letters. See also NASA's and ESA's press releases. March 2009: Is space turbulent? Yes! In a study in Physical Review Letters, we present detailed Cluster studies of turbulence in space. See ESA's press release. Dec 2008: We have tracked a previously invisible ion wind from the Earth far out in space using Cluster. Published in Nature Geoscience, presented in our press release and in an ESA Cluster top story. March 2007: We found that magnetic field reconnection occurs in turbulent plasmas, too. Published in Nature Physics, presented in an ESA news feature. Nov 2006: We reveal the inner structure of a region of space close to a magnetic reconnection site. Published in Physical Review Letters. Aug 2005: We discovered Alfvén vortices, a kind of whirlpools in space, near the boundary of the Earth's magnetosphere. Published in Nature, presented in our press release and in an ESA news feature. May 2005: On arrival at Saturn, our Langmuir probe on Cassini immediately detected cold plasma around Titan and plasma interaction with ring dust. Published in Science and Geophysical Research Letters. BepiColombo -- an ESA-JAXA (Europe-Japan) mission to Mercury, where we are responsible for the electronics and probe surfaces for the MEFISTO sensors of the PWI instrument on the magnetospheric orbiter. Launched in October 2018 for arrival at Mercury 2026. More on Bepi and MEFISTO at KTH. 4 x MMS -- NASA's Magnetospheric MultiScale mission, launched March 13, 2015, for which we provided sensor coating and test equipment for the electric field instruments built by the University of New Hampshire and the Royal Institute of Technology (KTH). More info on the SMART instrument suite for MMS at SwRI. 3 x Swarm -- ESA's three satellites for study of the geomagnetic field, launched in November 22, 2013. We provide instruments to measure the plasma density and temperature in the Earth's ionosphere. Solar Orbiter -- ESAs mission to investigate the Sun at close distance, for launch in 2020. We are building parts of the RPW instrument to study the solar wind close to its source. JUICE -- ESA's Jupiter Icy Moons Explorer mission. Together with a large team of European, Japanese and American laboratories, we will provide instrumentation for investigating waves, fields and plasmas in the Jovian system. Launch 2022, arrival at Jupiter in 2030. Cassini -- launched by NASA in 1997, explored the environment of Saturn 2004-2017, with our Langmuir probe onboard. Rosetta -- carried our instrument in orbit around comet 67P/Churyumov-Gerasimenko, launched by ESA in 2004, impact landing on the comet 30 September 2016. Numerous sounding rockets during the sixties, seventies, and eighties.